Seeming, we are reminded in Zoran Živkovi? 's The Last Book , is not being: seeming is a story we impose based on surfaces and expectations. Živkovi? 's metafictional mystery certainly seems, for much of its length, designed to convey an appreciation for what it labels "serious literature" over and above any attempt to itself be serious literature. Allusions to Umberto Eco's The Name of the Rose and exhortations to judge books by their content, not their genre, abound; meanwhile Živkovi? 's own story marches in lock-step with the most clichéd of mystery and thriller tropes. Yet by the novel's end it has become clear that the convivial evocations of Eco's work and of genre mystery signifiers must be read more as clues for the reader than as content to base expectations on. This is a novel that requires detective work, and ultimately its strength lies in its very un-genre acknowledgement that there is a world beyond its covers. 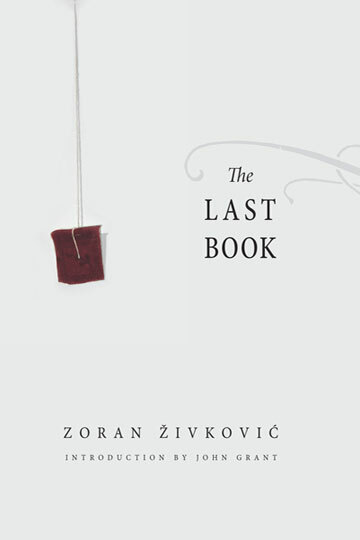 The Last Book (from PS Publishing in the UK, 2008; translated from the initial 2007 edition Poslednja knjiga by Alice Copple-Toši?) is assuredly not the last book from the Serbian fantasist, but it does bring Živkovi? 's career as a fiction writer nearly full circle from his debut novel, 1993's The Fourth Circle . That first book combined science fictional tropes with a cast of recurring characters, framed around a Sherlock Holmes mystery pastiche. In the intervening years Živkovi? 's works have varied between outright metafictions of writers, books, and their characters (often in his longer, more linear novels), and a catalog of human eccentricities and absurdities (mainly in his "mosaic novels" of linked short story suites). Now, The Last Book brings to the fore the background mystery that pervades Živkovi? 's mosaics— "how does this all fit together? "— in what is, like that first novel, the story of a consistent cast of characters that again explicitly adopts a mystery genre, in this case the noir, as its frame. The setup initially reads as a literary flavor of European noir. An innocuous death at the Papyrus bookshop brings literature-loving Inspector Dejan Luki? for a cursory investigation. Death by natural causes is the verdict: "Nothing about the death seemed violent" is the first line of the book (p. 3, emphasis added). This verdict is quickly cast into doubt, however, first by the odd fact that a coroner cannot identify any cause of death, and second by another death in the bookstore. The body count continues to increase, and when Inspector Luki? 's early hypothesis of a serial killer mimicking the murderer in Eco's The Name of the Rose is trumped by worries that the deaths may be the result of terrorism, the National Security Agency joins the case. The resulting eavesdropping and surveillance levered by the possibility of terrorism— and the atmosphere of characters under siege that follows— mark this, notably, as Živkovi? 's most overtly political work. All the more so because, with the novel's setting left unstated, there is the sense that this could be happening anywhere. A reliance on the unstated is characteristic of Živkovi? 's work, but in The Last Book he deploys the unstated for new purposes in a specifically genre context. As Inspector Luki? enters into a relationship with the co-owner of the Papyrus, Vera Gavrilovi?, as genre readers we know that Miss Gavrilovi? has the potentiality to be that staple of noir, the femme fatale. As the Inspector is brought quickly to Vera's bed, as she is conspicuously unreachable following another death, the dramatic tension increases precisely because we are aware of the forms of the genre. Živkovi? then promptly switches genres, as if to highlight the expectations brought on by our awareness. The story escalates, and the idea of a terrorist plot is replaced by that of a doomsday cult, dedicated to finding an Ur-text called (wait for it) The Last Book . Now the story has taken the form of a thriller, and now— and now unstated, unlike the earlier references— we are in the territory of Foucault's Pendulum , that other great "mystery" of Eco's that takes to task those who construct metanarratives out of seeming concordances. And now we're getting closer to the heart of the book, and to a position where we can talk about where it works and where it doesn't. "Detective novels? But they aren’t really serious literature." "Would you call Crime and Punishment or The Name of the Rose light literature?" "No, of course not. But I wouldn’t categorize them with detective stories either." Within the context of what seems to be a detective story, stated by a literature-loving detective, it is natural to assume that what is meant is that detective stories can really be serious literature. On the other hand, the more literal reading suggests a different meaning: that "serious literature" is literature that can be read like a detective story that requires investigation. Our initial expectations of the novel are shaped by its noir mystery elements: by the death revealed in the initial sentence and by the unknown killer; by the fact that the protagonist is a detective; by the rapid-yet-ambiguous relationship that develops between Dejan and Vera; by the setting of most key scenes at night, or in day darkened by rain. The story's telling adds to these expectations, containing all the rhetorical signposts of what Farah Mendelsohn has termed "intrusion fantasy" and linked with crime fiction ( Rhetorics of Fantasy ; see particularly pp. 116-117). There is a constant escalation of threat, a corresponding increase in the intimacy of the story, and a privileging of feeling over rationality. Živkovi? 's prose, meanwhile, is stripped down even by the author's own pithy standards. We are shown mainly surfaces here, and exchanges between characters are often trimmed to a Robert Parker-esque staccato of question-and-answer, frequently without character identifiers. We are, none too subtly it seems, being primed to reach a denouement (and "what kind of detective story would it be without a resolution to the plot?" ponders Dejan, p. 187) that will conform to all the expectations of the genre. Yet it is precisely on this surface level of detective story that The Last Book does not work, refuses to do so. The denouement, when it does arrive, feels tuned to offer a solution that may resolve the mysteries of the plot in all regards, yet does so with the absurd preposterousness of a Will Ferrell movie, deliberately blunting the expected satisfaction of a mystery logically solved. And Živkovi? gives many hints to his own attitude toward this surface story. After acknowledging their mutual attraction, Inspector Luci? and Vera Gavrilovi? part: "any other sequence of events would be characteristic of dime-store novels, and the book I'm looking for doesn't seem to be that," says Dejan (p. 45). Which seems clear enough, except that the very next time they see each other, the following evening, they do end up in bed. Later in the novel Dejan notes that, after becoming aware of external surveillance, Vera's "bearing was artificial, like an inexperienced actress" (p. 111). And indeed Dejan confesses a feeling of deja lu ("already read") about his own actions, a lack of agency that carries him through the clichés of the plot's twists and turns. The only times the characters show flashes of nuance and personality are the brief moments when the plot leaves them alone for a moment, when the matter of The Last Book is not intruding. And this, I think, is the key to Živkovi? 's novel. In The Last Book a crime has been committed. Let us be detectives and ask, whodunit? What has intruded, what has been intruded on? The serial killer, the terrorists, the doomsday cult: what Luci? 's investigation reveals is that these signifiers are symptoms of an intrusion, not the source. Within the world of the story, the ultimate intrusion is in fact The Last Book itself. At a surface level, as a clue, it is The Last Book as a physical object that is responsible for the deaths that drive the story, it is the MacGuffin that all are chasing. But in a metafictional sense, it is The Last Book as a story whose intrusion forces Dejan, Vera and the other characters to comport themselves according to a variety of prefigured genre roles and expectations. The intrusion is story, externally imposed narrative bound by too many expectations. Živkovi?, in other words, is traveling through the same garden of forking paths as such recent short stories as Veronica Schanoes's "Rats" ( Interfictions , 2007) and Theodora Goss's "The Belt" ( In the Forest of Forgetting , 2006). These works offer a postmodern primer on how we relate to story, and in particular the limits and dangers of the canned, ready-made narratives told constantly— by advertising, by political and religious organizations, by friends and family, by (too often!) fiction. People, tragically, can break their hearts trying to live the wrong story, somebody else's story. And the overt politics of this novel become integral thematically because politics increasingly is as much a matter of story, of metanarrative, as of policy; and a certain metanarrative of panoptic surveillance and conformity has been increasingly prevalent. Živkovi? here deconstructs the urge to impose these metanarratives on ourselves and the world (the linkages to Foucault's Pendulum become clearer), hijacks the foundation of the intrusion narrative that is at the core of too many formulaic and simplistic examples of fiction. By beginning and ending where it does, by being what it is, The Last Book rejects the possibility that there is a state or place of normality within the story that can be restored by removing the intrusion, by solving the mystery. The form of the story is the intrusion, and when externally imposed it cannot help but do violence. While the rhetorics of the novel seem directed toward acceptance of the fantastic— as the story escalates and forces us to confront more and more unlikely possible solutions— the intrusion when revealed marks a rejection of sort of fantastic embodied by the story, the imposition of pre-figured clichés and rigid expectations. This reliance on cliché and on characters flattened into role archetypes by plot necessities would make for a rather unbearable read, if not for the allusions and signifiers that Živkovi? uses to ensure that we know that he knows; if not for the brief, yearning flashes of humanity that Živkovi? allows to slip through the seams when the characters are least involved in the mystery of The Last Book . (And if not for Živkovi? being able to spin his tale in less than 200 pages.) These serve precisely to remind us of what the book is not, of what its absurd plot and breakneck pacing won't allow it to be. Unlike many novels that aim to be judged by how well they mimic the feel of reality, The Last Book wants to succeed based on the contrast it draws between what is in and outside of its covers. The "serious literature" that The Last Book idealizes, such as The Name of the Rose and Crime and Punishment , sets a high measure for success. Those works twine together richly compelling surface-level stories with carefully constructed metaphysical understory. By thematic necessity, Živkovi? 's surface story is more ironic; its pathos is generated by the very rarity of the glimpses it offers of humanity transcending its allotted roles in the story. It thus cannot not be judged completely successful by the standard of its own examples, being only half of an argument: The Last Book never offers itself as an argument for a world that appreciates the type of story it holds up as ideal. As an argument, though, it does have the ascribed characteristic of serious literature that it rewards investigation, requires it to be appreciated fully. The Last Book makes the reader a detective, and supplies the reason for doing so in its rejection of pat answers and packaged narratives. The success of Živkovi? 's novel ultimately lies in how artfully it reminds us that while we often speak of nuanced narrative as depicting shades of gray rather than mere black and white, the world itself is full of colors.